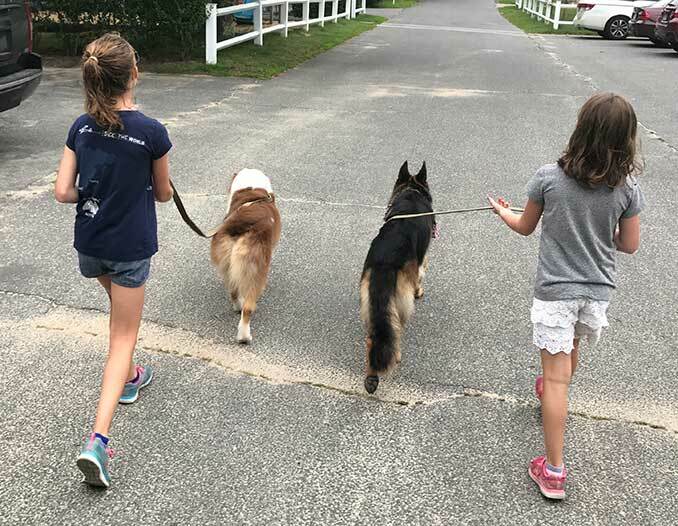 The dog-friendly community of Cambridge, Massachusetts was named a Best U.S. City for Walking by Prevention Magazine in 2018. Many factors also make Cambridge one of the best places to walk your dog in Massachusetts. The city is compact and primarily flat, with many popular and historic destinations within easy walking distance. Most streets have sidewalks, and the speed limit is no more than 30 miles per hour on all City streets. Our popular article, The Complete Resource Guide for Dog Owners in Cambridge, MA explores several dog-friendly parks and other places to walk with your dog in Cambridge, as well as answers to frequently asked questions about Cambridge dog licensing and dog safety. This article is designed to complement and build upon that information, to provide details about several more of the best places to walk or run with your dog in Cambridge. Features: This walk features dog friendly parks and recreation areas including Lechmere Canal Park, North Point Park, Paul Revere Park and more. Map: Use this PDF to explore the best places to walk your dog in North Cambridge as you follow a recent walking tour of the North Point Area, courtesy of the Cambridge Pedestrian Committee. Features: The North Bank Bridge features a concrete surface rising over Miller’s River and MBTA rail lines leading into North Station. The bridge railings include light strips for aesthetics and public safety. On the west end is North Point Park; on the east end is Paul Revere Park; each are excellent places to walk your dog in and around Cambridge landmarks. Features: Allows off-leash dogs. No fence. Provides opportunities to walk or run with your dog along the Charles River, with views of Zakim Bridge. Offers access to the Charles River Bike Path, which is one block away and extends 22 miles into Boston’s western suburbs, with opportunities to run or walk with your dog. Features: Known as the centerpiece of the East Cambridge riverfront, the canal is edged with gravel paths, lawn panels, and several types of trees and grasses for pedestrians to enjoy the green space as they jog or walk with their dogs. A tall jet fountain is the centerpiece of where the canal ends at circular basin, and wooden benches line the pathways. 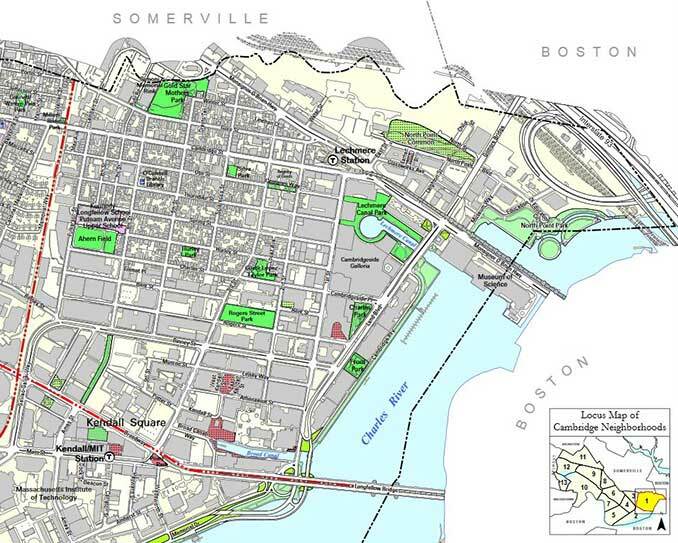 Map: Use this link to download a map of Lechmere Canal Park. Features: Fenced in dog-run area with water and toys for dogs. Off-leash dogs are allowed. Seating areas & shade trees. 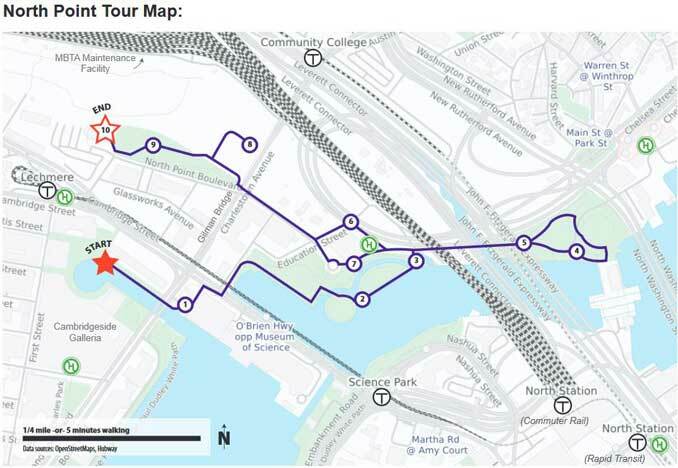 Features: Sites along this walking tour include the Fitchburg Cutoff Bike Path, Alewife Brook Reservation Wetlands, Cambridgepark Drive, The Minuteman Commuter Bikeway and Linear Path, and Discovery Park. Map: Use this PDF to explore some of the best places to walk your dog in Northwest Cambridge as you follow a recent walking tour of the Alewife area, courtesy of the Cambridge Pedestrian Committee. Map: Use this PDF to explore many of the best places to walk your dog in West Cambridge, as you follow a recent tour of the area, courtesy of the Cambridge Pedestrian Committee. Features: This popular park in the Boston area is also a National Historic Monument. It was reconstructed in 2015 to include new trees, lighting and paths for people to walk with their dogs, or run or bicycle. Centrally-located outside of Harvard Square, the park features a rich history and landmarks that attract national and international tourists. Features: Flagstaff Park features a new multi-use path provides additional connections people to walk their dogs, as well as jog, bike and more. multi-use path at Flagstaff Park that is adjacent to and part of the historic Cambridge Common. This new path along the Massachusetts Avenue side of Flagstaff Park creates a protected, two-way bicycle and pedestrian connection between Harvard Square and Massachusetts Avenue northbound. Features: The Minuteman Commuter Bikeway and Linear Path are two multi-use paths accessible from Alewife, with entrances to both just north of the Alewife T Station. This asphalt-surface rail trail through suburban Boston is popular with Cambridge dog walkers, runners and bikers. Moving northeast from Cambridge, the Minuteman Bikeway connects Arlington, Lexington and Bedford, with access to natural areas as Spy Pond and Great Meadows. Directions: By car to Alewife/Cambridge: Take Rte. 2 toward Arlington/Cambridge. At the end of the turnpike, bear right on Alewife Brook Parkway, then turn right on Cambridge Park Drive into the MBTA Alewife station, and park in the adjacent garage (parking fees apply). Three walking / biking paths merge at Alewife; the Minuteman Bikeway is located to the west of the station. Before walking (or otherwise using) the Minuteman Bikeway, be sure to review the Guidelines for Using the Path, courtesy of MinutemanBikeway.org. There are leash laws in Arlington, Bedford and Lexington that apply to the Bikeway. Keep your dog on a short leash.